Get started with a conversation today about your real estate needs in Citadel and the Calgary real estate market. 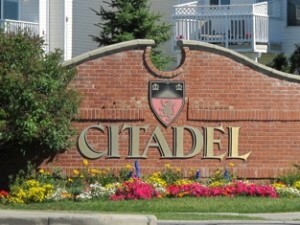 A relatively new community, the community of Citadel was established in 1993. Today, the community is bound to the north by Stoney Trail, to the south by Country Hills Boulevard, to the east by Sarcee Trail and to the west by Stoney Trail. The community is known for its numerous pathways, which all radiate from a central hub. The community’s roads are also designed to emanate from a central component, giving the community and its roads the shape of a wheel with spokes. The central area of the community features a large amount of green space, including a central park, a playground, tree-lined pathways, tennis and basketball courts, an outdoor hockey rink, baseball diamonds, soccer pitches and open space. While the Citadel community does not have a community centre, it does have an active community association that offers a number of special events throughout the year. Some regular community events include a Stampede breakfast, a winter gala, youth sports and senior programs. The community is also served by a public transportation system provided by the Calgary Transit.